Cool and Spicy » Toradora Figures! I have purchased several Toradora figures recently and have decided to review them all in a single post. I’d like to start with Kotobukiya’s 1/8 scale Taiga Aisaka which was released in October last year. Sadly, she was a mail order exclusive and thus was a tad more difficult to obtain. Thankfully, Tokyo Hunter was able to order it for me ^^. It was the first time I had used his service and he was able to promptly ship it out when it arrived :) Was a bit more expensive than most deputy services but if you want to order an actual mail order-only item when there isn’t even a Japan-only web order form, I would recommend his service. 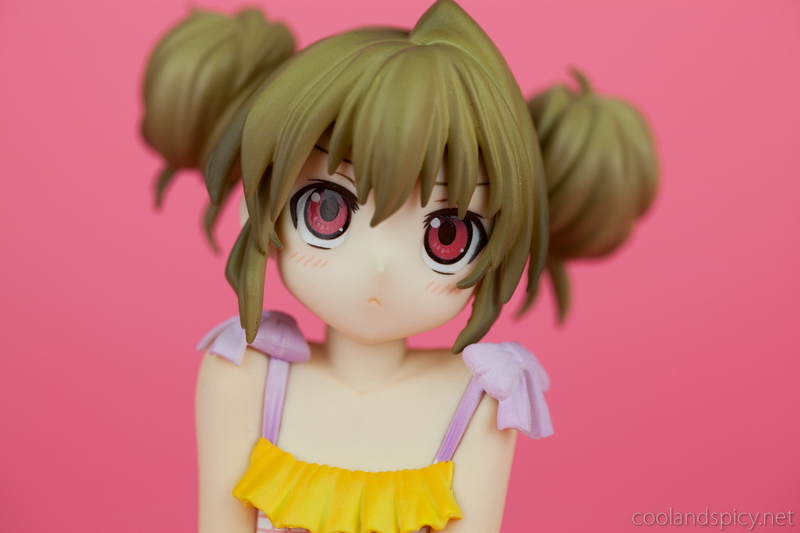 Palm-top Tiger Taiga is wearing an amazingly cute yellow, white, and pink swimsuit with some added frills and ribbons. Now that I think about it, how did Ryuuji convince Taiga to wear this? xD This is something that’s too cute for Taiga to just willingly put on. Well, not that I’m complaining, of course! The swimsuit you see here is not one that she wore during the anime but there are some artworks floating around with her wearing this suit. I know some other owners have mentioned build quality concerns with this figure. I don’t have any glaring issues with my copy but there are some problems. Parts of Taiga’s skin has light scuff marks. These are only visible upon close inspection and even then only from some angles. 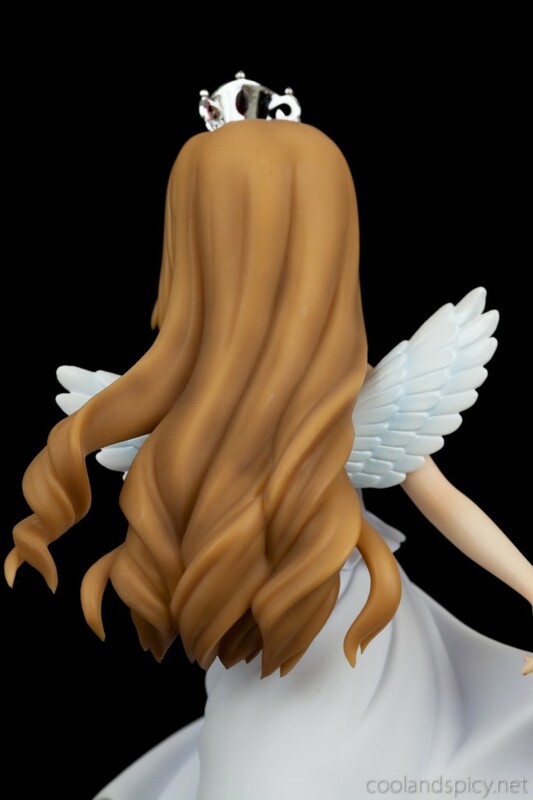 The seam on her hair is the only really obvious seam to me and it’s only apparent when looking at her from straight above. Paint quality is nothing special but isn’t notably bad either. One thing to keep in mind is that this is a very small figure. She is 1/8 scale, but she’s Taiga! You know, the palm-top tiger? To view these problems on such a small figure, you do have to look closely and doing this would reveal problems in nearly every figure. In other words, to me, she is of acceptable quality ^^. I just love her sitting pose. So cute! Taiga also comes with a nice water-float that can be placed on her lap. More reviews at: shadonia, The Inferno Project, OMGWebsite. 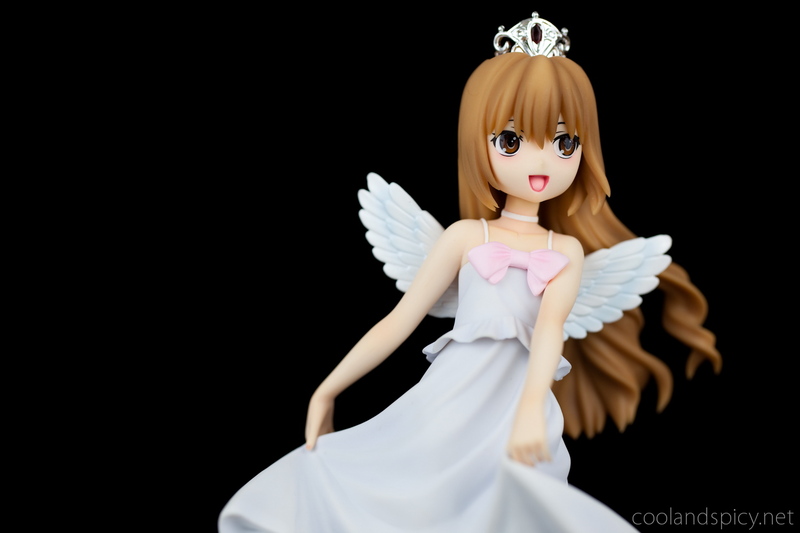 Taiga is modeled wearing the outfit Ryuuji made for her in episode 13 for the Miss school contest. Though it appears Taiga is wearing the dress before it was ripped. Not familiar with the ripped dress? Watch the series! A unique feature with this scaled PVC figure is that it includes 3 swappable faces. The default face is the happy face you see in the above photos. Also included is this sad, resigned facial expression. I tend to like the happy face the most but am also fond of this more melancholy expression. Given the situation that occurs in episode 15, this face is fitting. Or maybe this angry look is more realistic? 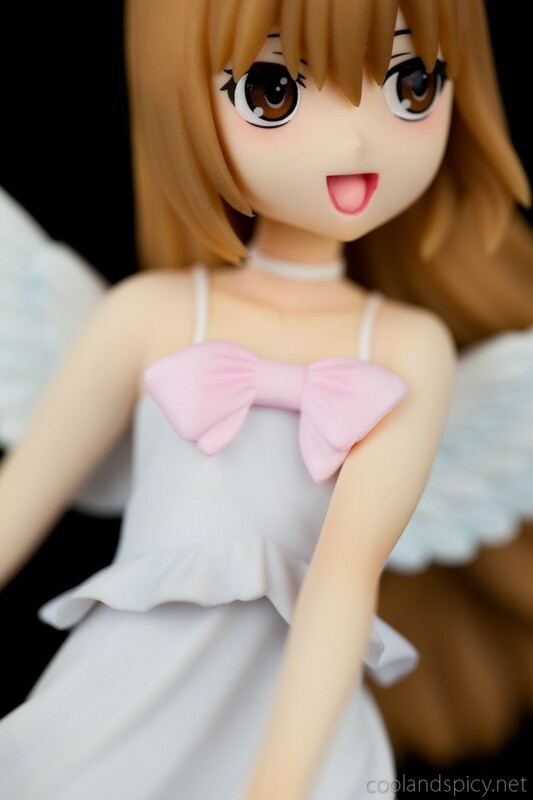 xD I think Taiga is more likely to get angry before getting sad..
Part of her outfit are these cute little angel wings. I kind would have liked them to be a tad more detailed, but they are still nice. So how is she? She is made by Wave whose quality is hit and miss. I do like her face. The eyes and blush shading looks good. Her dress, though, has some problems. For one, it’s really clumpy and doesn’t look very real as fabric and also has some visible blemishes where it should be a solid white. 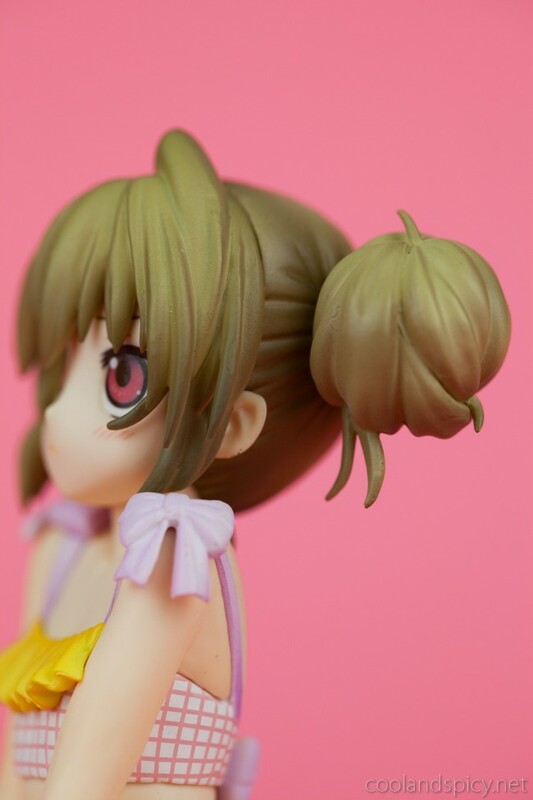 Since you can change the face on this figure, there is a rather large seam on her head where her face is swapped. So, yet again, not high quality but passable. 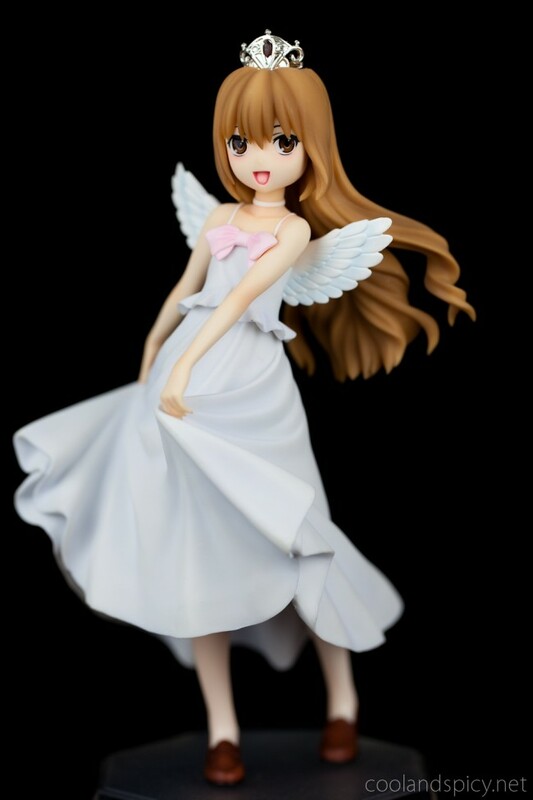 I wish Alter or Max Factory would stop making Nanoha figures and make some Toradora ones >_< You can grab this Taiga figure by Wave for 7,500 retail but is currently out of stock at Amiami and Hobby Search. Lastly, I have a small bonus for Toradora fans. Well, let’s just say that there’s a reason they were only 2,000 for the two xD Still, they’re cute! This post is way too long so that’s all for now! Thanks for visiting. Ah, Taiga figures, and three in one post :) I really love the first one, and the second one was tempting to buy but I decided to pass on it for now. I had no idea the dress was removable, would have never guessed it without seeing this review :o I really did love Toradora and my collection feels lonely without Taiga in it. I’ve considered buying the MegaHouse one because it’s on sale, but I haven’t been able to make up my mind. 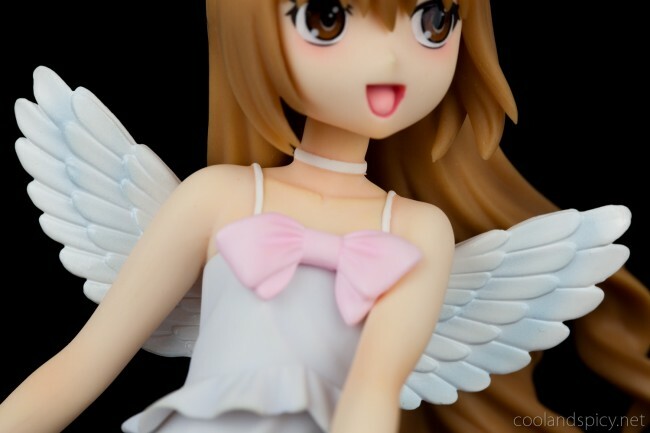 .-= anonymous_object´s last post… Toradora Figures! =-. Kotobukiya’s Taiga is definitely cute, and she does fit right in the palm of my hand even. She’s perfectly sized that way. I think your pink background shots bring out her colours a lot better than mine, she doesn’t look half bad. But then I remember the original paintwork… she would have been so much better. Oh well. 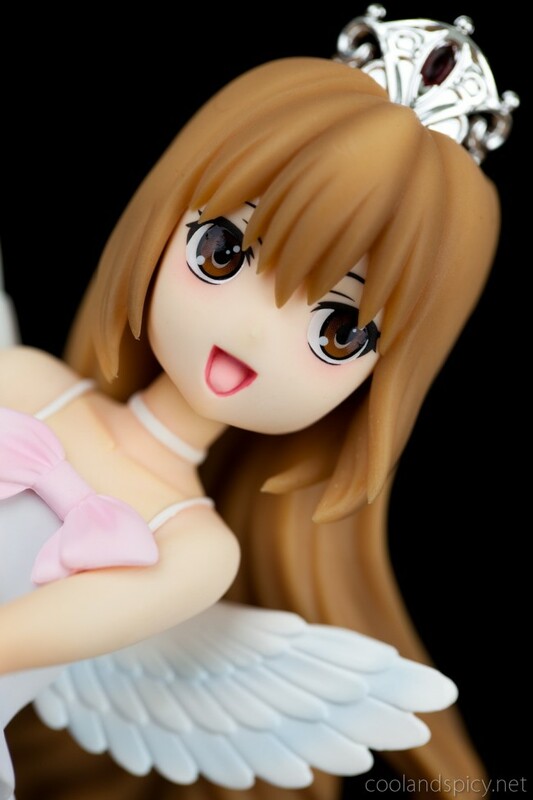 Wave Taiga is cute too but I don’t like her faces really, though the smiling one is best. I couldn’t stand Taiga’s character though, I think I got tired of Rie Kugimiya and bitchy characters. Don’t think she’s been a good tsundere since Shana. Didn’t like Taiga’s character!? People who don’t like Taiga should be chopped up and thrown in a mo, moru… morgue! But I like last two pictures best. Two dressing the same uniform are showing different expressions and characters. I write a blog in japan and send information of Japanese anime and manga. What kind of information do you want, if you visit my blog? 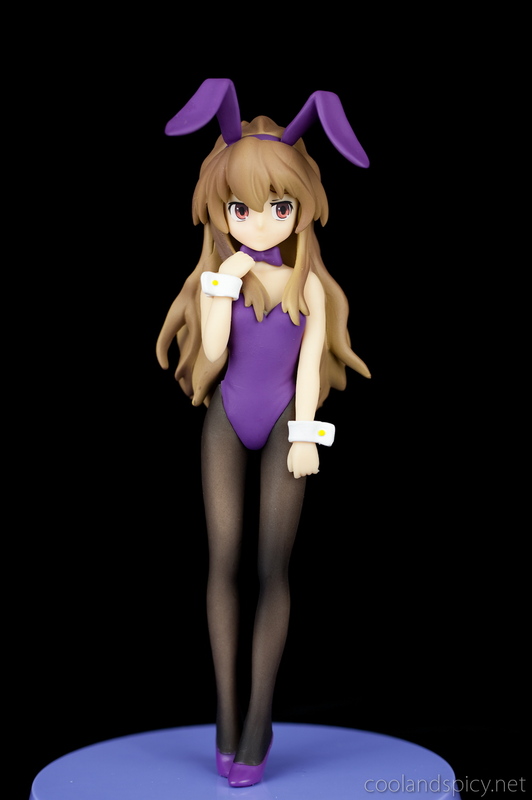 My favorite Taiga is, for the moment Kotobukiya Swimsuit version. She is expensive, but really cute (face and clothes). 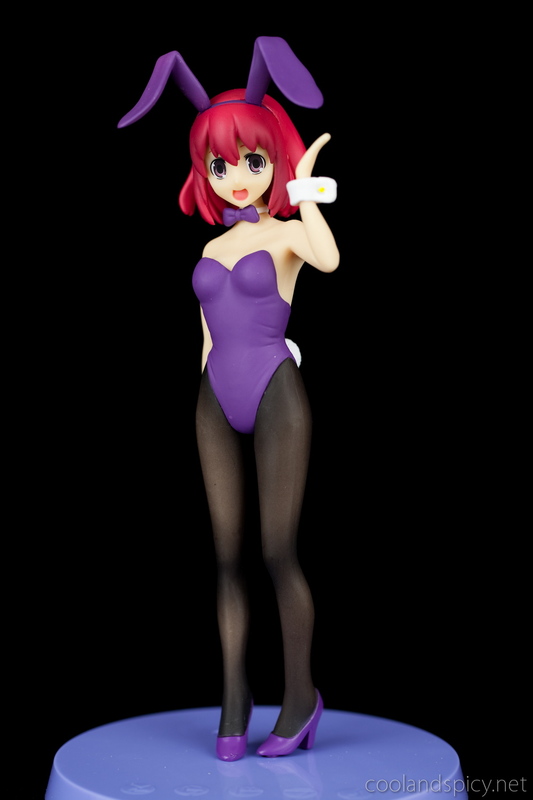 Max Factory version is adorable too, but like Kotobukiya adaptation small and now expensive. Wave version is cute too, I prefer smiling face. I hope anothers sculptures of Taiga because I really like her (an Nendoroid ?). Thank for the Shadonia link. I agree, Kotobukiya’s Taiga is my favorite as well ^^. They really succeeded in making her irresistibly cute! 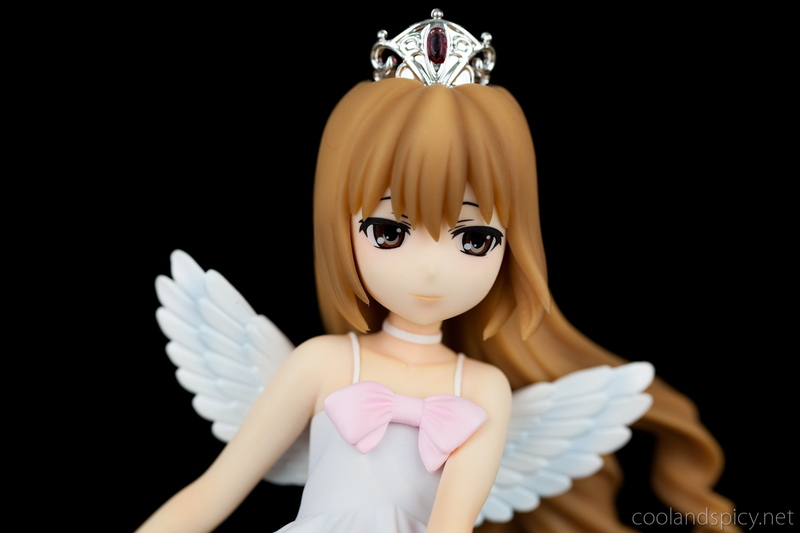 A Taiga Nendoroid… I would probably buy that! Those are cute. I especially like the bunny girl ones. .-= Yumeka´s last post… Pokemon Heart Gold and Soul Silver review (part 1) =-. Loved “Toradora”, was a great romantic comedy and surprisingly one that has a lot of realistic character depth and evolution, much more so than most romantic comedies we tend to see each season. Though it didn’t stick with me or impact me as much as had expected it would or as it did some other fans like you. .-= Smithy´s last post… So-Ra-No-Wo-To 11 =-. Well, 2000 yen… Isn’t that cheap, those look alright. At least, no glaring flaws from the photos. I’m beginning to think I actually like it when my figures come with tiny fixable flaws so I can design knife them up >.>… Especially figmas. Some of those were like peeling carrots. I’ve never seen the dress removed in other reviews either, I think. Maybe it’s my poor memory acting up. Oh well, I’m not complaining. Seeing Taiga in her swimsuit makes her look so innocent with that face ^^;;. But at the same time she looks cute as well because of that face lol. 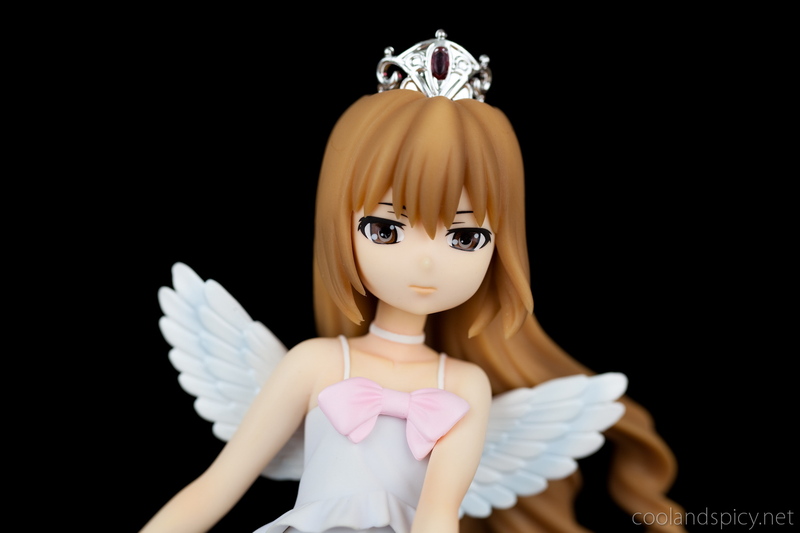 Didn’t know the contest Taiga had a swappable face, good to know. She has cute pantsu ^^. I added you to my blogroll, mind adding me back? Thanks. .-= AS´s last post… Tsumugi Kotobuki aka Mugi (K-On (けいおん)) =-. Sure, I’ll add you to my blog list. .-= Xine´s last post… Learning the Japanese language with Nintendo DS =-. .-= Firearky´s last post… Photo Review #2: Gwendolyn =-. .-= Firearky´s last post… Firearky in… XXXL Figureland… o.O =-. the swinsuit btw =D she looks so adorable! .-= Fabrice´s last post… Figure Pre-Order Update =-. I only own the Max Factory Toradora figure, as much as I like the ones you own the MF one is still my favorite. But to each his (or her) own ;) The buns in the bathing suit picture are adorable! 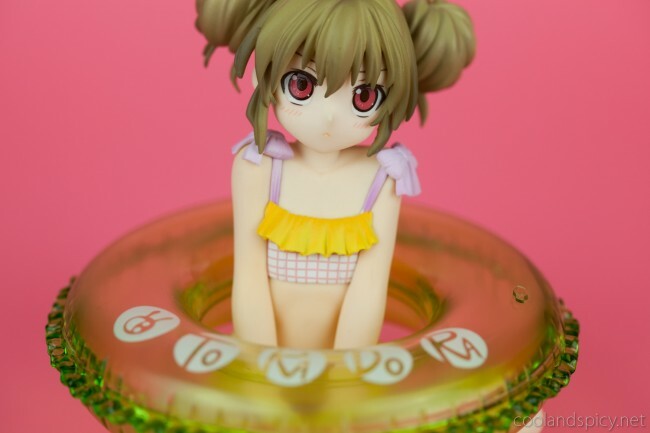 I have to say though… those 2000 yen for two figs are just cute. How big are they? Gachapon figure size? o.o? Hmmm, I know a lot of US shops get figures in stock a month or two late, so you might be able to find her through one of them. Or maybe ebay? Finding previously released figures is no fun >_< They're bigger than gashapons (at least all the ones I've seen). They're aboout 1/10 scale, I'd say. You know, it's funny because right after I saw this post and commented about those 2000 yen figures, a friend on Twitter coincidentally mentions that they were available somewhere and was thinking about buying them. I mentioned that I just found out about them too and want them but they were the last ones in stock… and… o.o let's just say I have free figures coming soonish. .-= ninjovee´s last post… Cosplayer In Focus: Maridah =-. That wave Taiga looks good, but I’m not too keen with how her “sad” face looks…maybe a watery eye look is more fitting for the occasion. It’d be nice if Alter will release a matching Taiga and Ami, but I doubt Max Factory will release anything that is not a figma. I haven’t decided whether or not to get the new Last Episode Taiga. I also think she looks a bit odd, but sometimes figures look better in person than what the promotion photos can show. Will have to think on it more. I have one amll question, how you put the water floating in the figure?